Now-a-days in various studies the effect of non-pharmacological therapies through the regimen on reproductive performance and the reduction of metabolic heart risk factors has been shown. Previous studies have shown that taking coenzyme Q1O (CoQ10) supplements with antioxidant effects greatly improves blood glucose control (glucose concentration, insulin concentration, insulin resistance and HbA1c), blood pressure, dyslipidemia (TG, chol), ovulation induction and preserving the ovarian reserve. [12,13] Animal studies have reported that CoQ10 increases the reproductive life of female rats up to 30%, and animals that produce more CoQ10 are more likely to ovulate and improve ovarian responses and hormonal changes in them. Therefore, due to the high prevalence of PCOS and its complications, as well as the significant effect of CoQ10 on various disorders in these patients and the lack of adequate and human studies in this field, we have investigated the effect of Q10 on AMH levels in patients with PCOS. This study was an interventional randomized clinical trial in which the effect of coenzyme Q10 on PCOS was measured over a period of 3 months. Patients who participated in this study were selected from all women with PCOS who were referred to the Kowsar Medical Center (Arak University of Medical Sciences, Iran). All the patients have proved to have PCOS according to Rotterdam Criteria. There were 30 women eligible to participate in the study. Exclusion criteria: CoQ10 supplementation in the last 3 months, Sensitivity to Q10 and lack of consent to participate in the study. After selecting patients, the variables including age, marriage status, history of pregnancies and the history of PCOS were extracted from their medical records. All patients were evaluated for AMH by Electrochemiluminescence Immune assay (ECLIA) using Cobas e411 instrument. 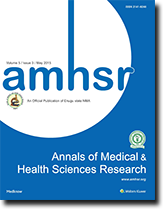 AMH levels based on current kits include natural ovarian reserve, AMH >1 and high reserve (often in PCOS patients) with an AMH> 3 and a normal lower limit of 0.10-9.0. Given the constant amount of AMH over the entire menstrual cycle, this test can be done at any time from the menstrual cycle. All the patients with a serum AMH levels of 5 and above were treated with CoQ10 pills (made in Zist Takhmir Co. Iran) for 3 months at a daily rate of 100 mg (one tablet). At the end of the third month, the patients returned to the laboratory and their AMH levels were measured again. The aim of the study was described for all patients, and then they were asked to attend the study by filling out the Consent Form. Patients were also free to withdraw from the study if they had adverse effects due to drug use or if they did not wish to continue their collaboration. Data were analyzed using SPSS software (version 20) and also using statistical tests such as t- test and ANOVA, and the level of significance was considered to be 0.05. In this study, 30 patients were selected among PCOS patients referred to Kawsar Medical Center (Arak, Iran). The mean age of patients was 23.3 ± 4.7 and the mean duration of PCOS was 4.8 years. The marriage status and the reason for referral were also studied in patients, which are listed in Table 1. 55% of patients were single and 45% of them were married. 78% of cases referred due to Oligomenorrhea. The effect of Q10 on the level of AMH was evaluated in PCOS patients. Results showed that CoQ10 in patients with PCOS significantly decreases AMH and the mean AMH level after CoQ10 administration in patients is obviously reduced [Figure 1]. Table 1: Demographic characteristics and measurement of AMH levels in patients. 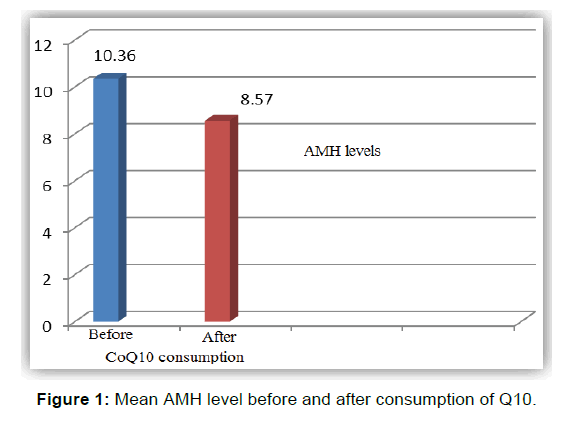 Figure 1: Mean AMH level before and after consumption of Q10. Managing and treating women with the polycystic ovarian syndrome (PCOS) is one of the major challenges in reproductive medicine. This syndrome is associated with a wide range of causes and clinical symptoms, including increased insulin levels, insulin resistance, and increased androgens. The initial causes of this complication remain questionable. However, due to the proven role of oxidative stress in the pathogenesis of PCOS, many studies have been performed on the effects of antioxidants on biochemical parameters and on the course of the disease and clinical manifestations of these patients in order to improve and treat these patients along with other treatments using these compounds. In this study, we also tried to investigate the role of antioxidant coenzyme Q10 in evaluating the effect of this coenzyme on the level of AMH as an indicator hormone in diagnosing patients with PCOS syndrome. The results of this study showed that CoQ10 consumption along with the treatment regimen of patients with PCOS significantly decreased AMH level and improved fertility. In general, the results of this study were encouraging, however, the CoQ10 dosage and the optimal duration of treatment should be further investigated. In addition, the effects of CoQ10 therapy on hormonal and metabolic profiles, hyperandrogenic symptoms and cardiovascular risk factors need to be further assessed on whether these risk factors may change, especially in PCOS. Therefore, it seems that CoQ10 may be a valuable alternative in developing countries for women over 35 who need faster treatment protocols. CoQ10 seems to be a promising, inexpensive and safe drug that lowers AMH levels, followed by improved PCOS. Umland EM, Weinstein LC, Buchanan EM. Menstruation-related disorders. DiPiro JT, Talbert RL, Yee GC, et al. (Eds) Pharmacotherapy: A Pathophysiologic Approach, (8th ed) New York: McGraw-Hill. 2011;1393. Aubuchon M, Legro RS. Polycystic ovary syndrome: Current infertility management. Clinical Obstetrics and Gynecology. 2011;54:675-684. Obstetricians ACo Ltd, Gynecologists. ACOG Practice Bulletin No. 41: Polycystic ovary syndrome. Obstet Gynecol. 2002;100:1389-1402. Moran L, Norman R. Understanding and managing disturbances in insulin metabolism and body weight in women with polycystic ovary syndrome. Best Practice & Research Clinical Obstetrics & Gynaecology. 2004;18:719-736. Turan V, Sezer ED, Zeybek B, Sendag F. Infertility and the presence of insulin resistance are associated with increased oxidative stress in young, non-obese Turkish women with polycystic ovary syndrome. Journal of pediatric and adolescent gynecology. 2015;28:119-123. Suresh S, Vijayakumar T. Correlations of insulin resistance and serum testosterone levels with LH: FSH ratio and oxidative stress in women with functional ovarian hyperandrogenism. Indian Journal of Clinical Biochemistry. 2015;30:345-350. Park A, Brown M, Rosencrantz M, Shayya R, Chuan S, Chang R. Serum AMH levels correlate with antral follicle count in PCOS adolescents. Fertility and Sterility. 2009;92:S99. Pellatt L, Rice S, Dilaver N, Heshri A, Galea R, Brincat M, et al. Anti-MÃ¼llerian hormone reduces follicle sensitivity to follicle-stimulating hormone in human granulosa cells. Fertility and sterility. 2011;96:1246-1251. e1. Nestler JE. Metformin in the treatment of infertility in polycystic ovarian syndrome: an alternative perspective. Elsevier; 2008. Neagu M, Cristescu C. Anti-Mullerian hormoneâÂÂa prognostic marker for metformin therapy efficiency in the treatment of women with infertility and polycystic ovary syndrome. Journal of medicine and life. 2012;5:462. Ravn P, Haugen A, Glintborg D. Overweight in polycystic ovary syndrome. An update on evidence based advice on diet, exercise and metformin use for weight loss. Minerva Endocrinol. 2013;38:59-76. El Refaeey A, Selem A, Badawy A. Combined coenzyme Q10 and clomiphene citrate for ovulation induction in clomiphene-citrate-resistant polycystic ovary syndrome. Reproductive biomedicine online. 2014;29:119-124. Farhangi MA, Alipour B, Jafarvand E, Khoshbaten M. Oral coenzyme Q10 supplementation in patients with nonalcoholic fatty liver disease: effects on serum vaspin, chemerin, pentraxin 3, insulin resistance and oxidative stress. Archives of medical research. 2014;45:589-595. Janzadeh A, Nasirinezhad F, Jameie S. Effect of Coenzyme Q10 on neuropathic pain in adult CCI Rat model. Journal of Gorgan University of Medical Sciences. 2012;14:10-18. Speroff L, Fritz MA. Clinical gynecologic endocrinology and infertility: Lippincott Williams & wilkins; 2005. Zuo T, Zhu M, Xu W. Roles of oxidative stress in polycystic ovary syndrome and cancers. Oxidative Medicine and Cellular Longevity. 2016;2016. Özcan P, Fıçıcıoğlu C, Kizilkale O, Yesiladali M, Tok OE, Ozkan F, et al. Can Coenzyme Q10 supplementation protect the ovarian reserve against oxidative damage? Journal of Assisted Reproduction and Genetics. 2016;33:1223-1230. Sharma A, Fonarow GC, Butler J, Ezekowitz JA, Felker GM. Coenzyme Q10 and heart failure: A state-of-the-art review. Circulation: Heart Failure. 2016;9:e002639. Miles MV, Morrison JA, Horn PS, Tang PH, Pesce AJ. Coenzyme Q10 changes are associated with metabolic syndrome. Clinica Chimica Acta. 2004;344:173-179. Farough S, Karaa A, Walker M, Slate N, Dasu T, Verbsky J, et al. Coenzyme Q10 and immunity: a case report and new implications for treatment of recurrent infections in metabolic diseases. Clinical Immunology. 2014;155:209-212. Molyneux SL, Young JM, Florkowski CM, Lever M, George PM. Coenzyme Q10: is there a clinical role and a case for measurement? The Clinical Biochemist Reviews. 2008;29:71.